A&M/Interscope Records announces the release of Sting’s new album, 57th & 9th, his first rock/pop project in over a decade, on November 11. Now available for pre-order, 57th & 9th represents a wide range of Sting’s musical and songwriting styles, from the ferocious, Road Warrior-style imagery of “Petrol Head,” to the anthemic, “50,000” and the raucous, guitar-driven first single, “I Can’t Stop Thinking About You.” The album was recorded with Sting’s long-time collaborators Dominic Miller (guitar) and Vinnie Colaiuta (drums) and includes contributions from drummer Josh Freese (Nine Inch Nails, Guns n’ Roses), guitarist Lyle Workman and the San Antonio-based Tex-Mex band The Last Bandoleros. Riding a wave of inspiration, 57th & 9th came together impulsively, with sessions completed in just a few weeks. Earlier today, he debuted “I Can’t Stop Thinking About You” with a world premiere performance on the Kevin & Bean show at KROQ, LA’s premiere alternative rock station. The single is available now at all digital retailers. The album, produced by Martin Kierszenbaum, takes its title from the Manhattan street corner that Sting crossed each day as he walked to the studios in Hell’s Kitchen where the recordings were done. Sting notes that if there’s a theme in the lyrics of 57th & 9th, it’s the idea of travel and motion, most apparent in the autobiographical “Heading South On The Great North Road” and in “Inshallah,” a first-person account of the global refugee crisis, written from a humanitarian point of view. First Single, “I Can’t Stop Thinking About You” Out Now at all Digital Outlets. 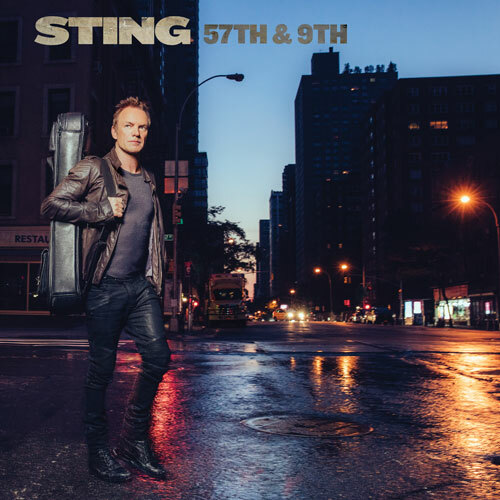 Sting “57th & 9th” eAlbum Pre-Order from: Official Sting Store, iTunes, Google Play, Amazon, Universal Music Store. Sting “I Can’t Stop Thinking About You” eSingle from: Apple Music, Spotify.